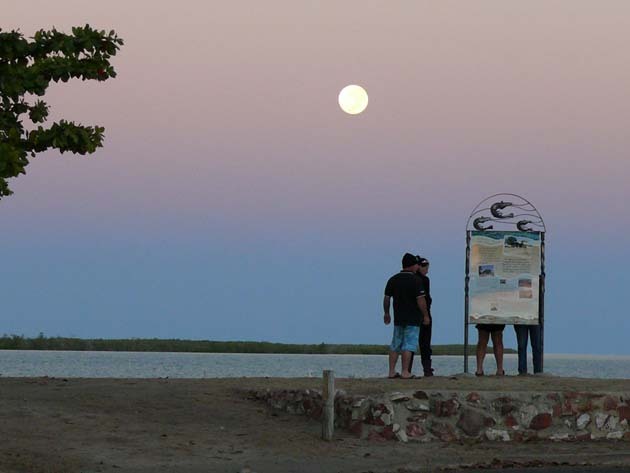 Crocs, prawns and barramundi aren’t all that the Gulf town of Karumba in northwest Queensland has to offer. I was recently surprised to see the diversity of wildlife on a Savannah Way drive out that way hosted by Tropical Tourism North Queensland (TTNQ for short). It was the time of the June “super moon” – the moon being at its closest distance to Earth – and we were treated to a beautiful sunset, moonlit night and stunning moon-set the next morning (pictured) as fishing boats headed out to sea at all hours. 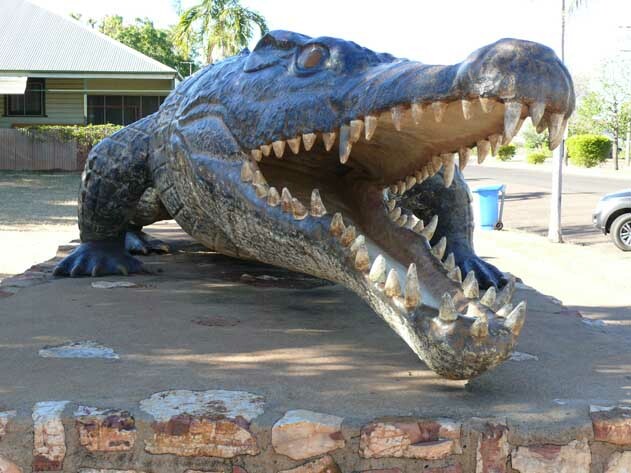 Fishing is a big drawcard for the Gulf of Carpentaria, but take care, the reminder that this is croc country can’t be missed by the 8.63m Krys croc statue (pictured top) on show in nearby Normanton’s main street. 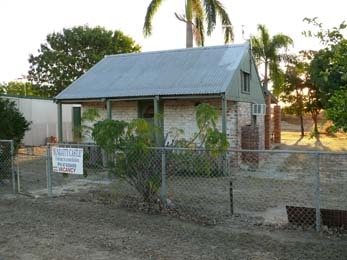 The original crocodile was shot by a woman, Krystina Paulokski, on the banks of the Normanton River in 1957. The river empties into the Gulf of Carpentaria at Karumba, some 832km from our starting point on the eastern coast at Cairns. For travellers short on time, Skytrans has regular flights from Cairns to Normanton, with car hire available. Karumba isn’t just for the fishing enthusiasts, although it certainly reels them in every year. Birdlife abounds, including the tall grey brolgas on the Muttonhole Wetlands, which extend some 30km inland. There’s a great little waterhole near the road at Karumba Point where pink galahs gather in the evening to drink and wading birds can be seen in droves in the early morning, sifting through the shallows. Kites gather on the powerlines around the town like pigeons do in other cities. Agile wallabies dart across the golf course and feed by the roadside at dusk. We head for the boat ramp as fishermen return with their catch, one visitor proudly lifting two barramundi from the large coolbox in his dinghy. Others are casting for bait as pelicans wander the beach in the hope of an easy feed. The town has good accommodation for anglers, from the character holiday unit of Bunratty Castle (pictured above), built from bricks carried four at a time by bicycle from the old town meat works, to multiple caravan parks and the spacious Ash’s Holiday Units and Café, which has rooms for up to six people and does a massive cooked breakfast to keep you going all day. As the sun sinks lower, the focus shifts to Karumba Point. Watching the sun set over the water, some three days after watching it rise over the Coral Sea north of Cairns at Palm Cove, is a fitting end to this segment of the Savannah Way drive. In between is a wealth of open skies, surprising natural encounters and a rich mining and pastoral history. Hope you can come and explore it too some day soon (dry season or winter is the best time). Check out drivenorthqueensland.com.au for trip ideas. This entry was posted in Adventure, Far North Queensland, Travel, Uncategorized and tagged birds, fishing, Karumba, Nature, Normanton, outdoors, travel, wildlife on July 26, 2013 by smscott2.